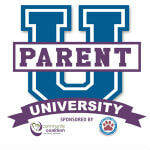 Parent University offers opportunities for parents and caregivers to continue their learning. Parent University events and presentations are facilitated by community professionals, school district staff and parents. Parent and caregivers are welcome to all courses, regardless of the schools their children attend. Childcare is available courtesy of The Moreau Community Center. call 518-581-1230 x3616 to arrange care in advance, if possible.